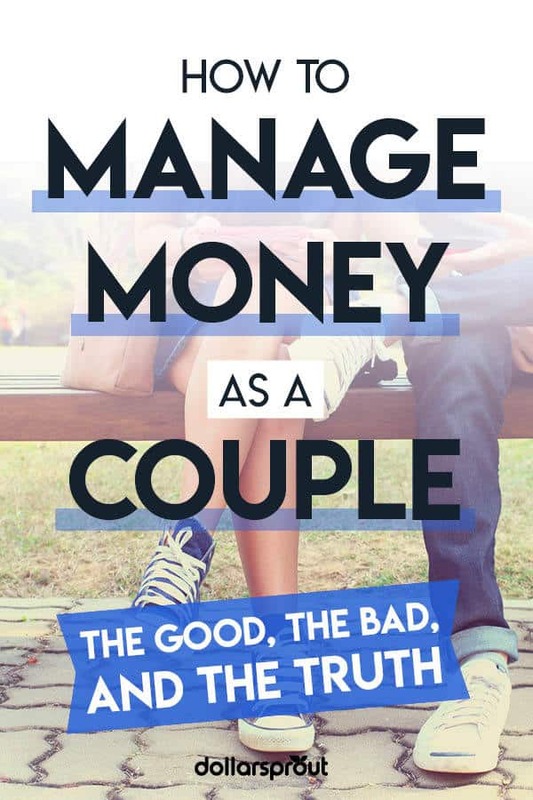 When it comes to money and relationships, there are numerous ways to combine finances with your spouse or partner. Likewise, there are many benefits to combining marriage finances, namely a shared sense of unity and responsibility. Sharing a bank account with your partner encourages you to work together to reach your financial goals, but it can also cause tension at times if you clash. One of the best ways you can alleviate new marriage money stress is to have open communication about your finances. If you’ve decided to combine finances after marriage, this is even more important. Just like any big change, there will be a transition period if you decide to combine finances with your partner. In the early stages of managing finances in a marriage, try to exercise patience. I’ve been married over 9 years, and I can tell you that sharing a bank account does get easier over time. My husband and I still have moments where we have to talk about a purchase or where we have a marriage money miscommunication. However, the way we talk about finances and relate to each other has drastically improved in the 9 years since we’ve combined our finances. Here are some steps to take in the early stages if you decide to combine finances with your partner. In the beginning, it’s important to start with some good habits, like scheduling your first “money meeting”. You can call this a budget meeting or a budget party, or even a money date. Then, cover the basics, learn about how you each handle money, and make sure you keep the conversation going. I recommend all couples, young and old, meet once a week to talk about money. You could also meet once a pay period to discuss together how you’re going to allocate the money you have coming in. Before your budget meeting, create a list of the things you want to discuss together. Ideally, you should be aware of your partner’s debt, income, and spending style before you get married. But if you haven’t discussed these topics yet, it’s better late than never. Also, try to lighten the mood. Bring snacks, a glass of wine, and make it more of a friendly get together. 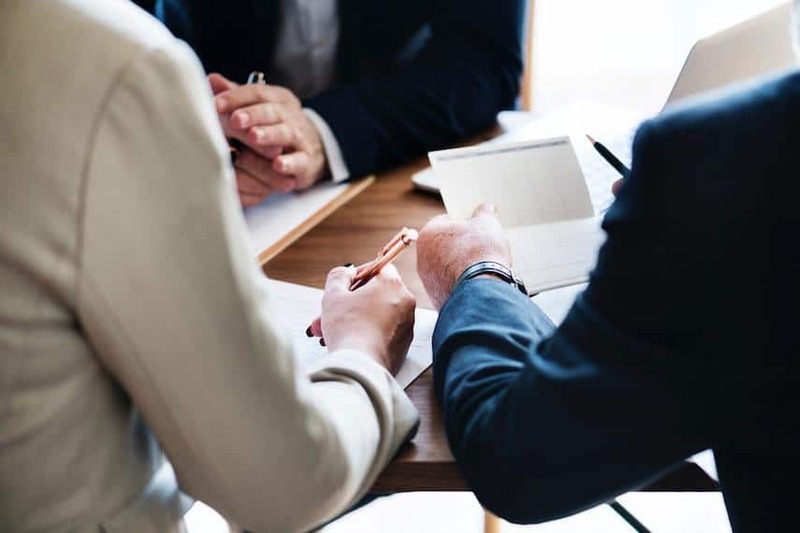 Although you might disagree or argue during the budget meeting, what’s important is you remember why you’re having the meeting: to prevent major financial issues down the road. Approximately 1/3rd of couples argue about finances at least once per month, and money is the leading cause of stress in relationships. Budget meetings can help alleviate that stress and help get you and your spouse on the same page. During the meeting, cover the basics like your income, debt, assets, and most importantly, your goals. When you’re sharing a bank account, it’s more important than ever to have a shared vision for your future. Here are some questions and goals to think about. Do you want to pay off all your debt quickly? Do you want to own a house someday? What about retiring early? Traveling the world? Having children? When you have a sense of shared goals, it makes the mundane, daily money choices much easier. For example, when you’re focused on saving for a down payment on a house, it makes it easier decide against buying a new couch and keeping your futon for just a bit longer. Even better, if these are shared goals, you can keep each other accountable. If your spouse wants to go out to eat at a fancy restaurant, you can suggest more affordable takeout. Then put what you would have spent at the fancy restaurant in your down payment fund. Small decisions like this and keeping your joint goals at the forefront of your minds creates a sense of unity and a shared purpose — two great things for a marriage. In every couple, there is usually a spender and a saver. Neither one is right or wrong. In fact, a saver can help a spender save for long-term goals, and a spender can help a saver enjoy their lives more and invest in experiences. Still, it’s important to acknowledge those differences as a couple and say what you appreciate about them. This isn’t about who is “better” with money or who is “bad” with money. It’s about coming together and learning about each other and how you can use those tendencies towards something great together. When my husband and I were first married, we made a rule that we had to ask the other person if we wanted to buy something more than $50. These days, that rule isn’t as stringent or necessary, but it helped us manage money in the beginning. Sometimes creating rules like this helps bring order to your finances. Additionally, giving each person spending money or an “allowance” to spend as they please (no questions asked) can help tremendously. Money meetings to discuss marriage finances are meant to be ongoing. They should be on your calendar at least once a month, preferably every week. Talk about money regularly, and discuss issues as they arise. Don’t be afraid to voice your concerns or keep each other accountable. Make a big list of financial goals and keep it somewhere you can both see it. Now that you’ve committed to learning about each other’s debt and income, spending styles, and setting some joint goals, it’s time to learn the mechanics of combining finances. 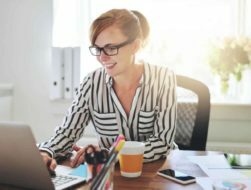 There are four common ways for actually combining your accounts and handling money together. This is just like it sounds. You and your spouse combine all of your money together. Investment accounts are joint if possible, and everything is in both of your names. When you spend money, you’re always spending it out of a joint account. You don’t have individual savings accounts or individual allowance or spending accounts. This type of money management system works well if you are both savers or both minimalists. Typically, if one person is a spender, a couple will benefit from having at least one separate account or one allowance account. You might be wondering what an allowance account is. This is when you and your spouse have a joint account that you use for all commonly shared expenses like your rent or mortgage payment, groceries, daycare costs, family trips, etc. Both of your paychecks go in the account and you both use it. However, every month, you put a certain amount of money in a separate “allowance account” for each person for individual spending. You can even put it on a prepaid debit card. This is money each person can use, no questions asked. They can also use this money to buy the other person gifts. Nearly half of couples with joint bank accounts also have individual bank accounts. This is different from an allowance account because this is when couples maintain full checking accounts individually as well as together. Some couples choose to divide the money among these accounts as a percentage. For example, each person’s paycheck goes into their individual accounts and then each person has to contribute 50% of their income to the joint account. This can seem unfair if one person makes considerably more money than the other or if one parent stays at home with their children. In that case, the allowance account might make the most sense. This is similar to the percentage joint and shared accounts except each person contributes an equal amount to the household finances. For example, if your household needs $6,000 per month to operate, each person will contribute $3,000 to the household account regardless of how much money they make. As evidenced, there are many ways to merge your accounts and your marriage money. I encourage you to pick one and try it. If it doesn’t work, try a different one. My husband and I combined everything when we first got married. However, over time it became evident that we needed allowance accounts. Both of our paychecks go into a joint account, but we each have a small allowance account we can use for whatever we like. My husband loves it because he gets some freedom to buy what he wants without feeling like he has to tell me if he bought something expensive. I like having an allowance too for the same reasons. Once you decide how you’ll manage and divide your money and how many accounts you’re going to have, it’s time to learn how to keep track of them. Personal Capital, which will show you your spending and your net worth. The EveryDollar App, created by Dave Ramsey. Honeydue, a budgeting app for couples. ProActive budget, a digital envelope app that couples can use. YNAB (You Need a Budget): this is what I use to manage my personal budget. However you decide to create a budget, make sure it’s something both of you have access to, and check it regularly. If you decide to have separate bank accounts, you can use the budget just for your joint expenses. However, I encourage you to be mindful of your individual accounts and honest about your spending and debt if you have it. 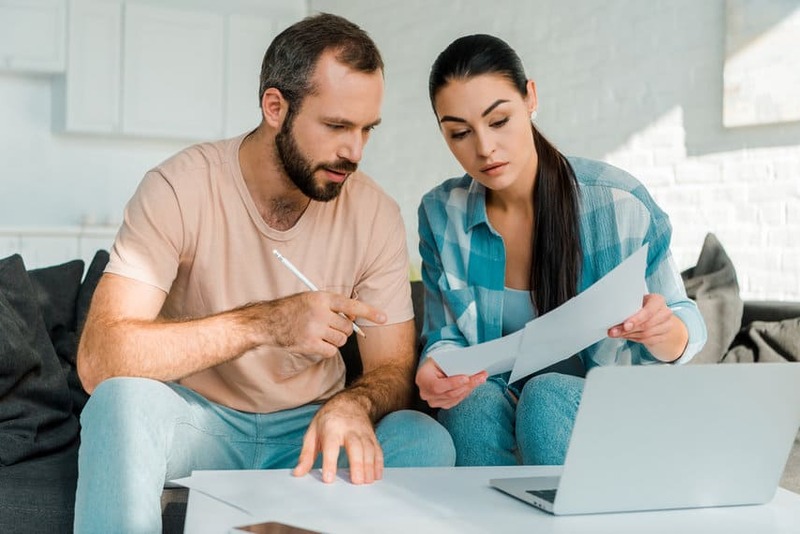 One important part of combining finances is deciding who is in charge of paying bills, monitoring your accounts, checking your credit, investing, and other financial tasks. Ideally, it should be both of you. But more often than not, one person in the relationship tends to take on more of the financial responsibilities. Also, the person who pays bills is responsible for keeping their spouse in the loop, letting them know everything is being paid in a timely manner or alerting them if there is an incorrect charge. This person will likely also nudge their spouse to check their credit from time to time and encourage them to save more and invest wisely. Ideally, you’ll talk about money early in your relationship. There might even be a need to combine finances before you get married, like if you live together and share rent expenses, utilities, and more. Either way, money shouldn’t be a taboo topic whether you’re dating, engaged, or married. It should be something you discuss regularly and openly. Money in your relationship doesn’t have to be stressful. It can be a big strength in your relationship, something you work on getting better at together, and something you can use to plan your future and achieve your goals with the person you love most. If you haven’t joined your marriage finances yet but you want to, start today with a simple conversation. It could be the start of something great and contribute to a real sense of unity in your marriage.